Leo Rising gives you a strong physique and lots of physical stamina. You can be very stubborn and find it extremely difficult to break undesirable habits and behaviour patterns. However, this same tenacity and stamina can also be a wonderful asset. When you get involved in something, you hang on long after everyone else runs out of steam, and you inspire others with your devotion to ideals and principles. Leo has loads of energy and enthusiasm, so, once motivated, you seldom hesitate to act. In spite of all this energy and enthusiasm, the Big Cat can be downright lazy at times. A natural enthusiasm inclines to overabundance and the tendency to overestimate everything. When buying various personal items, for example, you usually acquire far more than you need. Though often rash and hasty, your passions are sincere. 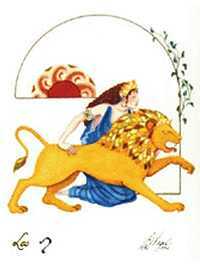 Leo is ruled by the sun, lord of willpower and egotistical drives. Your conscious or subconscious need to dominate means you want the last word in everything, and may come to believe your opinion is the only one worth considering. The negative potential for Leo Ascendant comes out in those whose ego-driven personalities turn them into manipulative, power-oriented demagogues. Though generally outgoing, you are not necessarily aggressive or loudly gregarious. Your personality will be greatly influenced by the nature and strength of your willpower and ego involvement (that is, the placement of your sun and whether it is strengthened by sign and aspect). If the willpower and ego are not strong, then neither is the personality apt to be assertive. No matter how the rest of the world may see you, it is meaningless compared to how you see yourself. Intense self-absorption makes it hard to accept guidance from others, and you may feel taking or asking for advice is a sign of weakness. You most enjoy associating with those who allow you to shine. Your flamboyant generosity and warm, friendly approach wins many friends, as well as arousing the envy of those with less popular personalities. Life with you is anything but routine. Your natural creativity gives special talent or ability in art, music, or the entertainment and communication industries. Overwork, anxiety, heart problems, lower back pains, and ailments connected with overindulgence are the most likely physical complaints. © 2019 astrologycom.com - All rights reserved.